Developed for the bioscience market, BioVyon from Porvair Sciences is a high-performance porous polymeric material manufactured to the highest cleanliness standards. This material, produced from high-density polyethylene resin using a proprietary process that can be modified, is activated and then formed into filtration media of different void volumes according to the target application. Of special note is the application of BioVyon in chromatography. 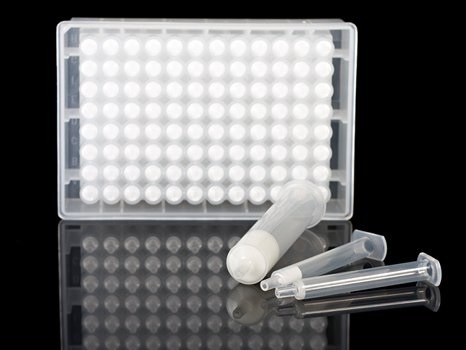 Used in filter and pipette tips, solid-phase extraction microplates (such as the Porvair Sciences MicroLute) and cartridges, BioVyon has found a niche with many blue-chip chromatography supplies manufacturers for the benefits it offers particularly in demanding scientific applications. BioVyon co-sintered products are made using a solid-state media created from an ultra-pure and highly modified polymeric material with the lowest levels of extractables and leachates. The technology allows high-purity silica or DVB resins to be supported in a matrix that provides a high surface area whilst reducing channelling through the column. As the porous material is co-sintered under high pressure and temperature with the BioVyon polymer matrix, the resultant frit or column is impervious to further compression and easily resists channelling of liquids, even at high flow rates.